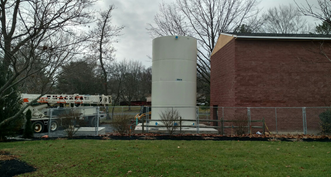 Horsham Water and Sewer Authority’s (HWSA) public water system supplies drinking water to approximately 7,800 residential, commercial and industrial customers using 14 deep water wells and purchased water from two adjacent water suppliers. Since July 2014 HWSA has been responding to the discovery of perfluoroalkyl and polyfluoroalkyl substances (collectively called PFAS and pronounced as “pee-fas”) in local groundwater resources. Two of the compounds in the PFAS family are Perfluorooctane Sulfonate (PFOS) and Perfluorooctanoic acid (PFOA). In 2009, EPA established Provisional Health Advisories (PHA) of 200 parts per trillion (ppt, or ng/L nanograms per liter) and 400 ppt for PFOS and PFOA, respectively. PHAs are health based advisories that serve as interim guidance while further research relating to the contaminants is performed. Both compounds were detected at elevated levels in groundwater on the former NASJRB and the existing HAGS, linking the presence of PFAS in the local groundwater resources to historical activity at these military facilities. Monitoring of HWSA’s public supply wells performed in accordance with the EPA’s Third Unregulated Contaminant Rule (UCMR3) revealed that five of the HWSA wells, 10, 17, 21, 26, & 40 contained concentrations of several PFAS. PFOS and PFOA levels in Wells 26 & 40 were found to be in excess of the PHA and both wells were immediately taken out of service. Both compounds were also detected in Wells 10, 17 & 21, but at levels below the PHA. Subsequent testing of the public supply wells at lower sensitivity levels than those prescribed by EPA under UCMR3 revealed the presence of PFAS at all 14 of HWSA’s wells. As a result of sampling performed by the EPA on behalf of the Navy, PFOS and PFOA was also discovered in many private wells surrounding NASJRB and HAGS at levels in excess of the PHA. In May 2015, EPA issued an Administrative Order to the Air National Guard (ANG), a component of the U.S. Air Force, and the U.S. Air Force mandating response actions relating to the contamination and designating specific areas of responsibility outside of the HAGS boundaries to the ANG. Although none of HWSA’s public supply wells are within the ANG area of responsibility, the area does include numerous impacted private wells. Given the tie of the contamination to both military facilities, in July 2015 and November 2015 respectively, HWSA entered into Cooperative Agreements (CA) with both the Navy and the National Guard Bureau (NGB) providing grant funding to carry out the necessary response actions associated with the contamination. In May 2016, EPA replaced the PHA with a Lifetime Health Advisory of 70 ppt for the combined concentration of PFOS and PFOA, prompting the shut-down of the HWSA’s public supply Wells 10, 17, and 21 and doubling the number of private properties with individual private drinking water wells exceeding the health standard. In light of concerns as to the evolving nature of the science regarding PFAS contamination in drinking water and the chronic, historic consumption in the community, in June 2016, and October 2016 respectively, the Township and HWSA jointly adopted aggressive short and long term plans with a goal of reducing the average PFOS/PFOA concentrations over its entire water system to non-detect levels. A PFAS surcharge for the purpose of funding recurring short and long term remediation efforts outside of those being funded by the military was subsequently instituted in September 2016. Through the efforts of State Representative Todd Stephens, with the support of Gov. Tom Wolf, Horsham was awarded a $10M grant in a bill that passed as part of the 2016-2017 state budget process. This funding is designated for capital costs associated with the long term plan. Upon full transition from the short to long term plan, Horsham’s public water supply will be sourced by 10 wells, all with PFAS removal filters installed, purchased water from one adjacent supplier also with a PFAS removal filter installed, and purchased water from a second adjacent supplier that has PFAS at or around non-detect levels. Four other production wells will be placed in a reserve status. The Long Term Plan is expected to be fully implemented by Fall 2019.